I am a guru of yoga, tantra and meditation. I am a teacher by profession. I am a guide by birth. In my practices I have realized that it is my dharma in life to be a vessel for the consciousness of the divine feminine in all of her forms. Some days I may appear as a mother, other days as an austere sage, and yet others as a voluptuous embodiment of Shakti. All of these forms are manifestations of the goddess, and none of them are to be disregarded or discarded. It is my mission to bring love, kindness, and compassion into this world. Pleasure is something that we are constantly attracted to, but without compassion all pleasure decays into disrespect and loss of face. We must roll with the tides, and accept the ebb and flow of the universe, all the while giving due acknowledgement to all seekers on our paths. I invite you to start your personal journey with me. 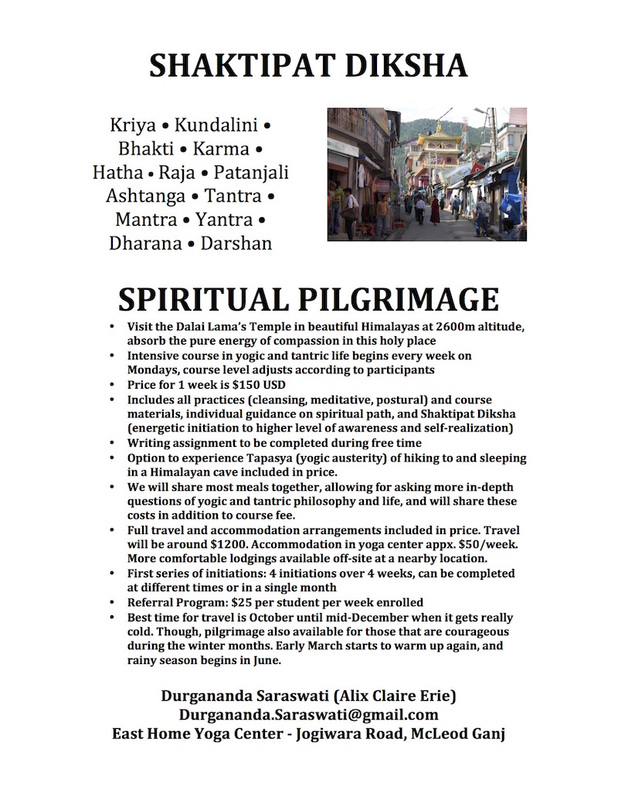 If you are able to join our course on-site here in Dharamsala, India, that is the best and most effective way to go. If this is an option for you and you are ready, please email me at ACErie@LimitlessExistence.org to book your course. A second option is that we have our teaching sessions virtually via your preferred manner of communication (Skype, phone, WhatsApp, FB video chat, etc.). We can discuss anything that causes disturbance to your mind and I will guide you to find a suitable solution. The solutions of Tantra are unbounded, and each individual will have a unique path to take for their expansion. Click on one of the buttons below to book your sessions. In this session you can ask me any question that you like about myself, my teachings, my personal life. Click this button and you will be redirected to PayPal where you can complete the transaction 🙂 I will receive a confirmation message with your email address, and I will contact you to schedule an appointment. In this hour we will enter into a discussion about your life and any issues that you are having that are preventing you from living your fullest life. Included in this price is a plan for removing these obstacles from your life. This package is used in conjunction with the Consultation hour for follow-up discussions and to continue removing the layers of karma that are causing obstruction in your life. This package is for the dedicated devotee that is ready to take the next step towards receiving Shaktipat Diksha, tantric initiation, with me, Durgananda Saraswati (Alix Claire Erie). In this 10 hours you will reveal your soul and add more power and purpose to your life. Upon completion of this series of personal discussions you will have a completely fresh and energized perspective of life.